ROCKIN THE HOUSE realty provides a detailed accurate MLS market listing campaign along with providing you with a Comprehensive Market Analysis of your property to be successful from the start. Jonathan Abbinante is a motivated experienced agent! The Art of Negotiating is earned by experience not a handbook. It’s important for Las Vegas seller’s to understand how the MLS works regrding the marketing and selling of a home. Because we at Rockin The House are professional Realtor’s, we can make the selling and marketing of any Real Estate look easy, but the reality is the marketing and selling of any home, Condo or Real Estate correctly is the product of many years of experience! . Rockin The House Will guide you on how to make your Home or Real Estate much more attractive and marketable by giving you the seller precise and accurate recommendations on how to improve your real estate or home and how to prepare your property for viewing to prospective buyers! ROCKIN THE HOUSE will help determine the best current market price and prepare a detailed market analysis of comparable properties that have sold within the past 4 months. ROCKIN THE HOUSE will inform you of current market trends and the state of the housing market. There is no greater help than knowing the competition. We will demonstrate the competition and how to beat them so you get the sale first! 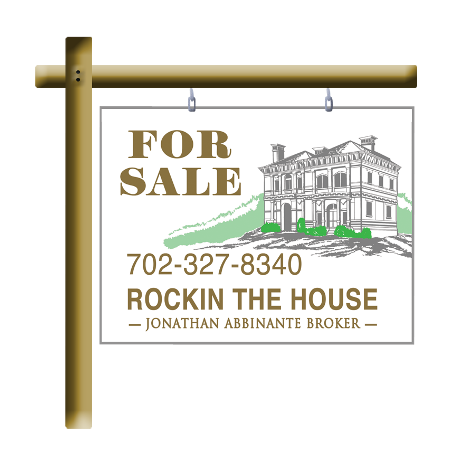 Rockin The House Will advertise your property in Multiple Listing Service. ROCKIN THE HOUSE will Advertise in the best online publications that will attract quality targeted buyers to your real estate . THE M.L.S HAS NO MATCH, because this kind of marketing attracts every Realtor hunting for a home that match’s their buyers criteria and are guaranteed a pay check. Rockin The House Will keep you totally informed of status of your real estate and of the current market conditions. Rockin The House Will review your home. condo or real estate’s market placement and after 30 days if your property has not sold we will make recommendations on what you must do to get it sold as quickly as possible. The Las Vegas MLS listings service covers the entire valley including Henderson Nevada. Rockin The House Will Pre-qualify Buyers with in-depth Screening so we don’t take your home off the market to buyers not capable of closing a deal. ROCKIN THE HOUSE realty Will negotiate the purchase agreement and represent your best interests during the multiple stages of the sale. Being a seasoned negotiator knowing how to negotiate the very best price for your home, condo or real estate. We will Assist the buyer or buyer’s in finding the best financing alternatives, if needed, to keep the transaction in place and closing. Rockin The House Will coordinate all of the closing details and be on hand to handle any last minute problems/crisis that might arise concerning the contract – inspection – appraisal. Here’s what’s up; SALES VOLUME! Las Vegas Nevada is going on four consecutive years of increases in home sales. There is a DEMAND for housing in Las Vegas today. BUYERS are BUYING approximately 50,000 homes per year in Las Vegas Nevada regardless of the woes of the current economy. Now, what’s down? : PRICES: We are going on five consecutive years of declining prices. So, why are prices still falling if DEMAND is so high? The answer is SUPPLY. Prices cannot increase as long as SUPPLY is equal to or greater than DEMAND. And the SUPPLY of Foreclosures, Short Sales, and Auction Sales will likely keep pace with DEMAND for another year or two; so don’t look for a rebound in home prices anytime soon. But hang in there. . . because the housing market in Las Vegas today is undervalued and overcorrected; and if you want to look like a genius five years from now, buy all the Las Vegas Nv. real estate you can today. In a housing market where foreclosures and short sales are the norm, new construction accounts for less than 10 per cent of all sales. The number of active homebuilders stands at just under 40 today, compared to over 80 in 2007. These remaining builders know that there are some buyers who want ONLY a new home, in a newer area, with the latest amenities and design, and the latest in energy conservation features, so they continue to fill that need. Buyers are often amazed how competitively priced new homes are today, even compared to foreclosure and short sale homes. In June 2011, the average price per sq ft for a new home was just $97.75, and some sold for as little as $55.57. News updates of the current market are researched in depth by many factors, trends and sold stats. Summerlin is one of Las Vegas past high appreciated locations and to this day one of our most expensive locations to live. Summlerin has been affected by the same outcome of the entire Valley,, Bank owned r.e.o. foreclosure property’s. There are many different locations of Summerlin to choose from. Lower to Higher end subdivisions. Depending on your price range Summerlin offers an incredible life style along with great shopping, golfing and many other amenities. Located in the “Re-Sale Homes Link” you will find Summerlins location in the North West selection, there you will see a fast variety of home foreclosures. Be sure to contact me to locate the very best price per sqft. Real Estate Deals today in all of the vast Summerlin locations.